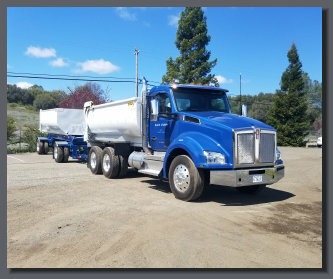 BLAIN STUMPF Rock, Sand & Gravel serves the Sacramento and surrounding counties with over 35 years of experience in dump truck service. Operating a fleet of 20 company trucks and numerous owner operators we can service anything from the homeowner to the largest contractor. Our fleet includes 10 wheelers, transfers and semi-end dumps, and access to double bottoms, semi-bottoms and super dumps. Included in our service is access to most all construction aggregates at competitive prices. Specialty aggregates for industrial uses, construction, and recreation areas such as golf courses, horse arenas, volley ball, and bocce ball courts. Go to our Gallery page to see measurements of transfer trucks height, width and length. See our video on "Slam-Bangs"
BLAIN STUMPF Rock, Sand & Gravel is working to "Go Green" by contracting with the Sacramento Emergency Clean Air Transportation Program by replacing several of the oldest diesel trucks in the fleet. Staying compliant to complement our customers' effort to "Go Green" too. Offering a range of aggregate products including construction materials, landscape materials and industrial minerals. In the Placerville yard, we stock culvert pipe in both corrugated steel and high density polyethylene.